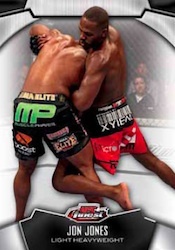 2012 Topps UFC Finest marks the return of one of the most popular MMA card brands. As always, collectors can expect a variety of colorful Refractors, and lots of relics and autographs. Every 2012 Topps UFC Finest mini box has an autograph, a jumbo fighter relic and a jumbo mat relic. All autographs and relics are printed on Refractors. Among the bigger pulls in the product are one-of-one relics with pieces of fighter mouth guards, sweepstakes entries autographed by Dana White and redemptions for autographed gloves. 2012 Topps UFC Finest has a 100-card base set. 2012 Topps UFC Finest has a 100-card base set. Base set parallels: White Refractor, Blue X-Fractor (#/188), Gold Refractor (#/88), Black Octa-Fractor (#/8), Printing Plates, Red Refractors (1/1). Each mini box of 2012 UFC Finest comes with three hits: an autograph, a jumbo fighter relic and a jumbo mat relic. Finest Moments (25 cards, 1:6) look at specific fighter achievements. Parallels: Blue X-Fractor (#/188), Gold Refractor (#/88), Black Octa-Fractor (#/8), Printing Plates, Red Refractors (1/1). There are lots of MMA lineage in UFC. Famous families are celebrated in Bloodlines (25 cards, 1:6). Parallels: Blue X-Fractor (#/188), Gold Refractor (#/88), Black Octa-Fractor (#/8), Printing Plates, Red Refractors (1/1). 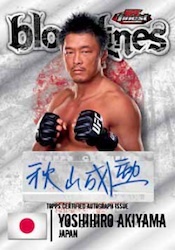 Finest Fighter Autographs (35 cards) include both on-card and sticker signatures. Parallels: Gold Refractor (#/25), Black Octa-Fractor (#/8), Printing Plates, Red Refractors (1/1). Thoughts from the Boss (15 cards, #/25) have autographs from both a fighter and UFC head, Dana White. White also shares his feelings on the featured fighter. Finest Moments Autographs (15 cards). Parallels: Black Octa-Fractor (#/8), Printing Plates, Red Refractors (1/1). 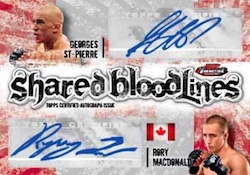 Bloodlines Autographs (15 cards) are appropriately signed in red ink. Parallels: Black Octa-Fractor (#/8), Printing Plates, Red Refractors (1/1). Shared Bloodlines (10 card, #/25) are dual-signed cards. Finest VIP Pass (#/50) are autographed contest entries. Those that pull one will find White's autograph on the card. They can then use it to enter to win a trip to a UFC event, a pair of tickets and access to a fighter meet-and-greet beforehand. Autographed Glove Redemptions (25 cards). All autographs feature Refractor technology. Grill Gear Relics are one-of-one cards with a piece of a fighter's match-used mouth guard. Jumbo Finest Threads (30 cards, 1:6) have an over-sized piece of fight-worn gear. Parallels: Blue X-Fractor (#/188), Gold Refractor (#/88), Black Octa-Fractor (#/8), Printing Plates, Red Refractors (1/1). Finest Fight Jumbo Mat Relic Card (30 cards, 1:6) have a massive piece of an Octagon mat. Parallels: Black Octa-Fractor (#/8), Printing Plates, Red Refractors (1/1). All relic cards come on Refractor stock. Finest Fight Mat Jumbo Autograph (20 cards, numbered) are signed directly on the canvas. Autographed Jumbo Finest Threads Relic Card (30 cards, numbered) mix fight-worn relics and signatures. Finest Sponsors Autographed Patch Card (10 cards, numbered) have a patch from a UFC sponsor, such as TapouT alongside a fighter's signature. Shared Bloodlines Dual Autograph Relics (10 cards, #/10). Good: You are guaranteed six hits per box, which gives you two autographs, two jumbo relics, and two jumbo mat relics. Some highlights of the autograph checklist includes Randy Couture, Brock Lesnar, Chuck Liddell, Anderson Silva, Georges St. Pierre, and even Dana White. The base and inserts have a solid glossy design that showcase amazing photography from inside the Octagon. I love the look and design of the Autograph Jumbo Thread Relics and Thoughts From The Boss Dual Autographs. Great innovation for the Grill Gear Relics which has a fighter's piece of a fight-used mouthpiece on the card itself. There are also Autograph Glove Redemption cards and Dana White Autograph VIP Pass Redemption cards that can be redeemed to win a trip for two to a live UFC event, complete with a fighter meet and greet. MMA collectors should love this product. Bad: Like any product, the autographs and relics can be hit or miss. For such a premium product such as Finest, you really don't expect to see some of the lower-tier MMA fighters among your hits. Many of the autographs are also stickers. You only get 60 cards per box. This means it will take several boxes to put together the 100-card base set. There are no base cards of Ronda Rousey, but she does have her first autograph card. The Bottom Line: 2012 Topps UFC Finest is a premium MMA product that cost around $90 per master box at its time of release. This is very reasonable, especially compared to other products with similar configurations. With six hits per box, the end results can be rewarding with so many autographs of top fighters included in the product. The overall design of this product definitely lives up to the Finest brand and reputation. There is a reason why Finest is always one of the most anticipated products each year. The base cards have a solid glossy design and puts the sole emphasis on the fighter in the center of the card. The card photography showcase action shots, fighter poses, and victory celebrations. The fighter's first name, last name, and weight class are at the bottom center of the card. There are six different parallel variations: White Refractor, Blue X-Fractor, Gold Refractor, Black Octa-Fractor, Red Refractor, and Printing Plate. Finest Moments and Bloodlines are the two basic insert sets of 2012 Topps UFC Finest. Finest Moments has 25 fighters and spotlights the fighter's top MMA accomplishments. Bloodlines is a 25-card set that shows the country the fighter comes from. The Jumbo Mat Relics have a large swatch of the actual mat which is bordered around an octagon. The Jumbo Finest Threads Relics have a large swatch of fighter-worn gear embedded on the right side of the card. 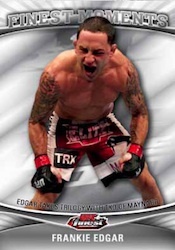 The Fighter Autographs, Finest Moments Autographs, and Bloodlines Autographs are basically like the basic versions of the card with a sticker signature on the front. The two dual autograph designs are Thoughts From The Boss and Parallel Bloodlines. Thoughts From The Boss has 15 cards with an autograph of Dana White and another fighter. Parallel Bloodlines has ten cards and highlights fighters from the same country. 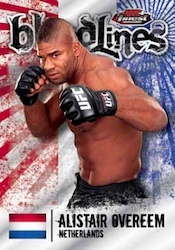 This dual autograph set also has a card of MMA Legend Randy Couture and his son Ryan Couture. The Jumbo Mat Relics, Jumbo Threads Relics, and Parallel Bloodlines also come with autograph versions. The base set is comprised of 100 cards. This is the same count as the last Topps UFC product, 2012 Topps UFC Knockout. This product has a mixture of current fighters from UFC and Strikeforce. There are no retired legends or UFC personalities, though. 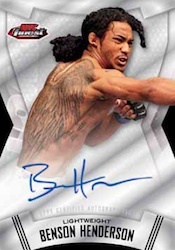 Topps has to balance their UFC product to include cards from the always-growing UFC roster, so there are some people who should be included that won't have cards in every release. If they are focusing on current fighters, it is odd that they only included one female fighter: Miesha Tate. Rounda Rousey is nowhere to be found in the base set, but at least has an autograph. 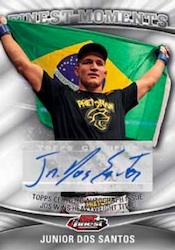 One highlight of the 2012 Topps UFC Finest checklist is that majority of the top recent UFC stars have autographs. These include Jose Aldo, Randy Couture, Urijah Faber, Brock Lesnar, Chuck Liddell, Ronda Rousey, Anderson Silva, Georges St. Pierre, Cain Velasquez, and Dana White. 2012 Topps UFC Finest master boxes cost around $90 when it first came out. These master boxes have two mini boxes, each of which has six packs of five cards. Each mini box contains an autograph, a Jumbo Fighter-Worn Relic, and a Jumbo Mat Relic. Out of the 60 cards in our box, we pulled 38 Base Cards, eight White Refractors, two Blue X-Fractors, two Gold Refractors, two Bloodlines, two Finest Moments, two Autographs, two Finest Threads, and two Mat Relics. Considering this is a premium product, there is a lot of value. The rewards far exceed the risks. Topps has made another amazing UFC product that introduces different designs and innovations. 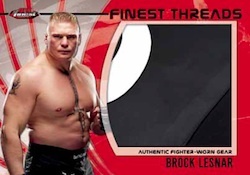 2012 Topps UFC Finest can be seen as one of the company's top products. There is an abundance of great card designs in the set. The different autographs, relics, and parallels should keep set builders busy buying and trading. While there are stickers on a lot of the autographs, they come in different combinations, which helps. The redemption cards for Autograph Gloves and VIP Passes to a live UFC Event cap a stellar release. 2012 topps finest ufc hobby box ronda rousey rookie auto ?